FBS provides power in numbers with 8 current employee benefit cooperatives in the State of Texas. A larger risk pool results in more competitive premiums and provides more stability with longer rate guarantees. Take the guess work out of managing ACA. With attorney-backed guidance, FBS in partnership with Eligibility Tracking Calculators (ETC) provides expertise on the Affordable Care Act. ThinkHR's dynamic tools, checklists, builders and guides enable rapid deployment of HR best practices across the entire organization, all for a low cost for employers. "At FBS you're going to get a different level of customer service than you are anywhere else." "The ease of customer service is terrific. You won't find better people to work with." To speak to a Benefit Consultant, contact FBS today. 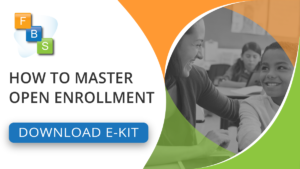 See how you can master open enrollment with our free E-Kit download. It’s no secret – healthcare costs continue to skyrocket. this and the ongoing pressure to attract and retain valued employees using competitive benefits are forcing employers to evaluate alternative solutions to balance out inflating healthcare costs. one of these solutions includes switching from a fully-insured health plan to a self-funded health plan. As an independent broker, FBS works with leading carriers nationwide to provide the Total Benefit Solution.